Although not bred by Mrs. Balding, the fact that 'Silver Starlight' even existed was probably due to her foresight. For a number of years, her 'Ch. Silver Lambkin' was in her own words "Progenitor of nearly all the leading Chinchilla cats". And this was indeed the fact. Being as she was an astute breeder with inherent wisdom in this regard passed down to her from her very experienced father Mr, Fred Gresham, (an established and already famous breeder of St. Bernards), she was only too aware of the need for an outcross for her own "Lambkin strain". When that opportunity finally arrived in 1894, with the arrival of a Silver male in the form of 'Silver Laddie' who in that year appeared and won a first and a Cup at the 'Crufts Show', Mrs. Balding wasted no time in obtaining him for her breeding program, for the specific purpose of an outcross. This farsighted move not only gave her the ability to move forward with her own program with confidence, but also the many breeders with whom she shared her lines. This success was made even more evident, when he sired the likes of 'Silver Starlight' and the amazing 'Champion Zaida', who in her day became the most famous and decorated Chinchilla since the birth of 'The Silver Lambkin'. 'Silver Starlight' was born 23rd April 1898, bred by a Mrs. Walford-Gosnall, from her Silver queen 'Minette' (aka Menette or Minnette). 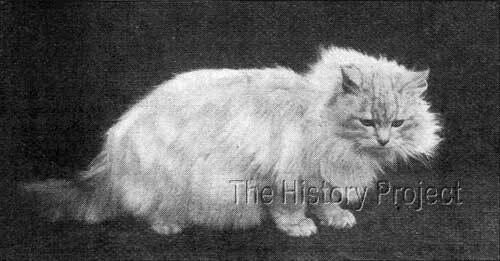 'Minette' could have been either a Chinchilla silver, or a light silver tabby, given that her sire was 'Ch. Felix' (a silver tabby by Ch. 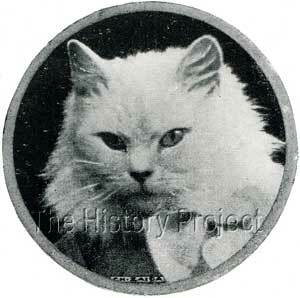 Topso of Dingley) and her dam was 'Lavender', a shaded silver Persian. Mrs. Walford-Gosnall was an experienced breeder of both Blues and Chinchillas, and carefully bred 'Minette' each year to a different and popular silver or Chinchilla stud male. 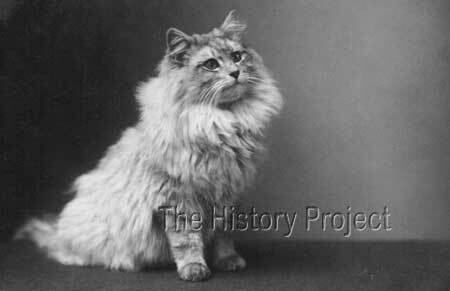 In 1899 she was bred to 'Ch. Lord Southampton' and in 1901 to 'Silver Chieftain'. But in this litter of 1898, sired by Mrs. Balding's 'Silver Laddie', came 'Silver Starlight', a light-coated Chinchilla male, who was to become the future stud of Miss Snell, of Wimbledon. Although 'Silver Starlight' has no full siblings of note, he certainly had a number of sire and dam siblings of considerable fame. The most notable of these would have been 'Champion Zaida' a sire sibling and top show winning Chinchilla female, who like the cream, rose to the top of the Silver show ladder, and who, like him, was famous for her clear coated splendour. 'Zaida' was living proof that it was possible to breed a silver without any known 'Silver Lambkin' in the bloodline, giving even stronger credence to the decision of Mrs Balding in bringing 'Silver Laddie' into the mix as an outcross for all the cats down from 'Beauty of Bridgeyate' and either 'Ch. Perso' or 'Ch. Nizam'. Another notable half-sibling, was the Chinchilla female, 'Charterhouse Pixie', who as the daughter of 'Silver Laddie' and a full sibling of 'Silver Cherub', came to fame as the dam of 'Silver Tod Sloan'. In effect, 'Silver Tod Sloan' was the culmination of two sets of selective outcrossing and then breeding back into the original line, doubling ONLY on 'Beauty of Bridgeyate'. 'Beauty' had been outcrossed firstly to 'Ch. Nizam' to produce, 'I, Beauty's Daughter', who was subsequently bred out again to 'Silver Laddie' to produce 'Charterhouse Pixie'. This made 'Pixie' the product of two full outcrosses, the only common denominator being 'Beauty of Bridgeyate' as the dam of her own mother, and the dam of 'Ch. Silver Lambkin' (by 'Ch. Perso'), to whom 'Charterhouse Pixie' was now bred to produce 'Silver Tod Sloan'. This male joined the ranks of the Balding stud cats, proudly standing alongside the likes of his sire 'The Silver Lambkin' and his Grandsire, 'Silver Laddie'. As a stud male, 'Silver Starlight' was highly sought after, especially by those breeders who already possessed the best lines from the 'Silver Lambkin' strain, now looking for a fresh new outcross with the possible promise of that elusive but highly prized quality, of a 'clear coat'! At least two of the four most prized Chinchilla females in the country were bred to him, including Lady Marcus Beresford's 'Windsor Dimity' and Mrs Marriott's 'The Seraph', both esteemed daughters of 'Ch. Lord Southampton', the leading son of 'Ch. Silver Lambkin. And it was from these two females that a new generation of males and females began to contribute to the expanding Silver Persian gene pool. 'The Handy Man', born 25th August, 1899, out of Miss Shapcott's 'Aphrodite', retained by Miss Shapcott for breeding. 'Edgware San Toy', born 2nd May, 1900, a Shaded Silver male out of Mrs. Newberry's 'Mona', sold to Miss Findlater. 'Puck III', born 18th April, 1901, out of Lady Marcus Beresford's 'Windsor Dimity', sold to HRH Princess Victoria of Schleswig Holstein. 'Windsor Silver Shell' born 18th April,1901, out of Lady Marcus Beresford's 'Windsor Dimity', retained by Lady Beresford for breeding. 'Lord Clive', born 24th April 1901, out of Mrs. Marriott's 'The Seraph' (aka Whitehall Seraph), sold to Mrs. Evan Humphrey. 'Windsor King', born 24th April 1901, out of Mrs. Marriott's 'The Seraph' (aka Whitehall seraph), sold to Lady Marcus Beresford. 'Tommy Dodd', born 16th August, 1901, a Shaded Silver male out of Mrs. Clayton's 'Lady Maude', retained by Mrs. Clayton, for breeding. 'Little Silver Hair', born 25th August, 1899, out of Miss Shapcott's 'Aphrodite', retained by Miss Shapcott for breeding. 'Barnes Starlight', born 22nd April, 1900, a Silver female out of Mr Minahane's 'Chiswick Snowball', (a white daughter of Ch. White Friar), sold to Miss Florence Slatter. 'Pepita', born April, 1900, a Silver female out of Mrs. Grey's 'Kathleen', sold to Mrs. Battley. 'Windsor Silver Bubble' born 18th April,1901, out of Lady Marcus Beresford's 'Windsor Dimity', retained by Lady Beresford for breeding. 'Windsor Silver Etoile', born 24th April 1901, out of Mrs. Marriott's 'The Seraph' (aka Whitehall seraph), sold to Lady Marcus Beresford. 'Whitehall Gorgeous', born 24th April 1901, out of Mrs. Marriott's 'The Seraph' (aka Whitehall seraph), retained by Mrs. Marriott, for breeding. 'Iver Clara', born 14th May 1901, a chinchilla female out of Mrs. Nicholay's 'Lady Clare', retained by Mrs. Nicholay for breeding. 'Iver Clarette', born 14th May 1901, a chinchilla female out of Mrs. Nicholay's 'Lady Clare', retained by Mrs. Nicholay for breeding. 'Iver Clarina', born 14th May 1901, a chinchilla female out of Mrs. Nicholay's 'Lady Clare', retained by Mrs. Nicholay for breeding. 'Iver Lady Clare II', born 14th May 1901, a chinchilla female out of Mrs. Nicholay's 'Lady Clare', retained by Mrs. Nicholay for breeding. From even these few listings, it becomes clear that the progeny of 'Silver Starlight' were greatly valued. Mrs. Nicholay in particular started out by holding all four Chinchilla females bred from him and her female 'Lady Clare', and Lady Marcus Beresford snapped up both a male and a female from Mrs. Marriott's 'The Seraph' while the opportunity existed! 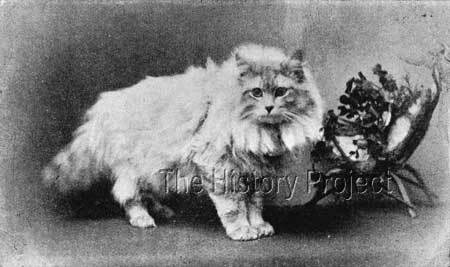 Although there are no records of any progeny from the famous 'Zaida', it was certainly rumoured that she also had been bred to 'Silver Starlight', being reported as a distinct possibility in gossip columns of Our Cats in 1903. A version of this handsome photo of 'Silver Starlight' by Landor, appears in the 1902 edition of Frances Simpson's book 'Our Cats and All About Them', in a vignette type exposure; but this much clearer view of this very appealing male, was obtained from a Rotary Photographic Series postcard.